Dirty Words: Fourth Internet-Facing MOSS 2007 Site Launched! Fourth Internet-Facing MOSS 2007 Site Launched! I'm happy to announce we rolled out our latest MOSS 2007-based internet facing web site yesterday afternoon. The Australia's Coral Coast site is the latest (and greatest?) web site to re-launch on the Tourism WA partner site platform, as it's known internally, since June. The dev team did most of the hard development work earlier in the year and we've pretty much handed over to the service delivery and content management team; SDCM are now restructuring each site's information architecture and updating and SEO-ing the content as it's brough across from a corresponding, legacy MCMS site. Even though the dev effort is tapering off (we're still fixing bugs and tweaking), it's amazing to see these templated but distinct internet sites rolling off the line without a hitch. This site is the last of the regional tourism organisation sites to be relaunched this year but we've got two more to go before this phase of the project wraps up and we move forward with the stack of visitor centre sites and campaign sites. 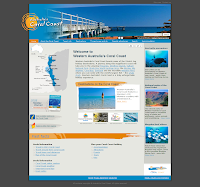 Compare the new Coral Coast site with the MCMS-based Experience Perth site and let me know what you think.